In Photoshop CS6, choose File→Place to put PDF (Portable Document Format), Adobe Illustrator (AI), EPS (Encapsulated PostScript), PSD, JPEG, TIFF, BMP, GIF, PNG, and several other lesser-used file formats into separate layers of their own. These files are often created by programs other than Photoshop (such as Adobe Acrobat or Adobe Illustrator) or acquired from your digital camera. 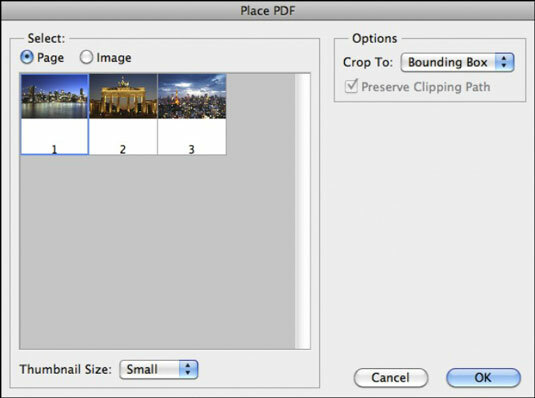 Although Photoshop can open these files independently, you can use the Place feature if you want to combine them with an existing image. Open an existing document into which you want to place a file. The Place dialog box opens. Navigate to the file you want to insert and then double-click the file. If you’re placing an Illustrator file, make sure it was saved with PDF Compatibility selected in the Illustrator Options dialog box. Otherwise, it may not be placed. For some types of files, such as multipage PDF files, you may see a dialog box, which lets you specify which page you want to place. You can also select either the entire Page or just a particular Image on the page. Finally, select how much of your image you want to place from the Crop To pop-up menu. The default bounding box crops to the smallest area that includes text and graphics. Photoshop automatically places PDFs, JPEGs, TIFFs, or PNGs (among other image types) as Smart Objects. Your image appears in a bounding box in the center of your Photoshop image. If you want, reposition the artwork by positioning your cursor inside the bounding box and dragging. You can also transform (scale, rotate, and so on) your placed artwork, if you want — by dragging or rotating the handles on the bounding box or by entering values on the Options bar. Hold down the Shift key to constrain the proportions when scaling. You don’t have to be concerned if your placed image is a Smart Object, but be careful about sizing non–Smart Object images. If you enlarge them too much, you may degrade the quality of your image. Avoid degradation of quality by creating a Smart Object. Note that when you place a file, you can’t edit the text or vector artwork in it within Photoshop. Why? Because Photoshop rasterizes the file, using the resolution of the file into which you placed it. You can, however, edit a Smart Object in the program it was created in, such as Illustrator. Note that when art is larger than the Photoshop image, Photoshop downsizes the art so that it fits the image. If you’re placing vector artwork, select Anti-Alias on the Options bar if you want to soften the edges of the artwork during the transformation. Not selecting the option produces a hard edge. Double-click inside the bounding box to commit the placed image to a new layer. You can also press Enter (Return on the Mac) or click the Commit button (the check icon) on the Options bar.